It’s that time of year again where stores are filled with heart shaped everything. I’ve always been ambivalent to Valentine’s day but in recent years I’ve noticed this day of love has evolved into a celebration of not just romantic love but of self love, familial love and friend love to name a few and I like that! There are so many different relationships to celebrate why limit it to just one type? With this in mind we curated February’s Ritual Pedicure to align us with giving and receiving all types of love. Moonstone and Rose Quartz are the perfect stones for this month’s ritual as they enhance our ability to attract and receive love. Often times, we keep love at bay from an unconscious fear of not being good enough. 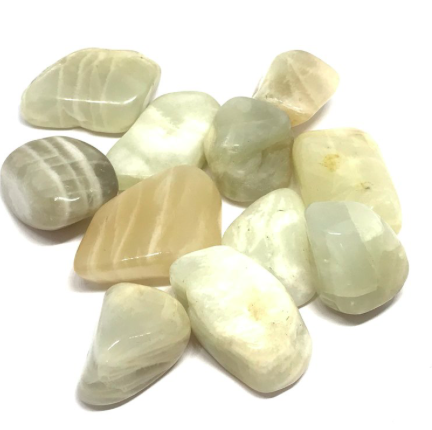 Moonstone helps us release some of the protective barriers we have set up and become more receptive to receiving love. Rose Quartz is also well known for its properties of enhancing all types of love, including self-love. Let this combination of gemstones align you with the abundance of love available to you. Our rose filled pedicure bowls will be charged with the loving energy of Moonstone and rose quartz as well as coconut milk to hydrate, nourish and support you. Rose Otto Essential oil – A warm facial compress will introduce you to this collagen stimulating, stress relieving pure essential oil that is said to help boost self confidence and enliven the heart. It is known to have a great effect on the heart chakra, as it raises one’s frequency to the high notes of unconditional love and divine abundance. Lotus Wei Fierce Compassion Flower Essence mist: Rose, hollyhock, mandevilla and rhododendron flower essences are combined to empower you to love, nurture and care for yourself, increase your confidence in relationships and heal emotional wounds. Liberate Your True Self’ “Sacred Heart” Tea – A specially selected blend of herbs to open your heart and evoke more love for yourself and in your life. All Ritual pedicures include extended neck and shoulder massage as well as lower leg and foot massage. Indulge yourself or share the experience with someone special.